Ever been sitting at work and realized that you wanted to record something on your home DVR? Time Warner Cable (TWC) customers now have this options. Here is how to do it. This method works from an iPhone, Android, or any other internet enabled device. I was looking for an iphone app to control my TMC DVR when I discovered this method for controlling your DVR from your mobile phone. This will also allow you to control your DVR through an internet-enabled computer. 3. 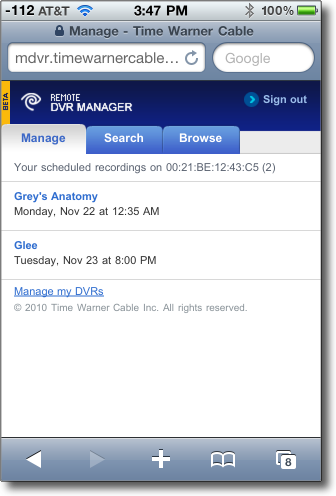 Select the Manage, Search, or Browse features to control your DVR records. Of note, this may not work with your regular TWC username and password. 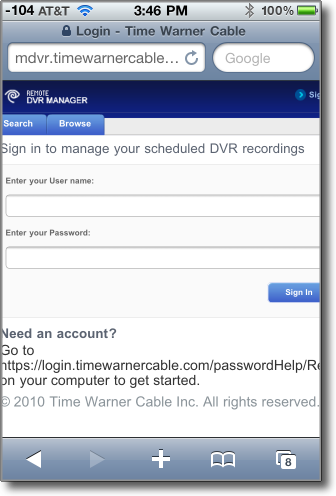 If you have problems logging in, go through the process of setting up your TWC MyServices account first.